The apex court’s high-powered environment panel said that the illegal mining was carried out allegedly with the “tacit” approval of the previous Digambar Kamat government. NEW DELHI: Rampant illegal iron ore mining in Goa, which has devastated the state, is much larger than the illegal mining in Karnataka, and the Union ministry of environment and forests granted green clearances to 162 mines near national parks and sanctuaries in breach of Supreme Court orders, a report by the CEC (central empowered committee) said. The apex court’s high-powered environment panel also said that the illegal mining was carried out allegedly with the “tacit” approval of the previous Digambar Kamat government. The report was presented on Friday by amicus curiae A D N Rao before a bench of Justices Aftab Alam, K S Radhakrishnan and Swatanter Kumar. The report said that the state experiences plenty of rainfall, which washes the sediments of iron ore mining to the rivers, choking and irreversibly damaging the sensitive Zuari and Mandovi estuaries complex, said to be the largest in the country. The CEC said that during 2006-2011, 39.56 million tonnes of illegal iron ore was exported from the state. “The bulk of the mining leases are in the forests or natural vegetation and consequently mining has take a heavy toll on Goa’s natural vegetation and wildlife,” the environment panel said through member secretary M K Jiwrajka. 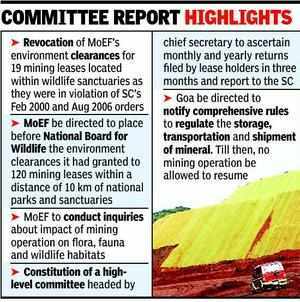 “The environmental clearances granted by the Ministry of Environment & Forests, (MoEF) for the 19 mining leases located within the wildlife sanctuaries and for another 23 mining leases located within a distance of upto 1 km from the boundaries of nearby national parks / sanctuaries being in violation of this Court’s orders dated. The mining operations in such mining leases may be prohibited,” the report said. The 124-page report was placed before a three judge bench headed by Justice Aftab Alam which would consider its findings and recommendation in the next date of hearing. Taking note of the Justice M B Shah Commission report which estimated a whopping Rs.35,000 crore loss to the exchequer due to illegal mining in the last 12 years, the bench had halted mining operations in all the 90 mines in Goa. It had also asked the CEC to submit its report on the illegal mining in the state within four weeks. The committee in its report said that on the line of Karnataka, Goa also prepare a reclamation and rehabilitation (R&R) plan and the apex court should examine the environmental clearances given to the mining leases. The CEC said that mining operation be allowed only after Environment Impact Assessment is done and reclamation and rehabilitation (R&R) plan is prepared. “The mining operation may be allowed to be resumed in Goa by the mining leases not found to be involved in any illegalities only after (a) the Macro Level IA study report of the ICFRE is received by this Court and decision regarding Taluka wise ceiling on permissible annual production from all the mining leases is taken (b) the survey and demarcation of the mining leases by the team constituted by this Court is completed and (c) the R&R Plans are prepared,” the report said. The Committee also recommended that additional Principal Chief Conservator of Forests, Bangalore may be directed to verify that the mining operations will not have adverse impact on the flora, fauna or wildlife habitat and the status of the forest areas have correctly been stated by the companies for seeking environmental clearances. “This court may consider taking a decision regarding validity of such environmental clearances after considering the recommendations of the Standing Committee of the National Board for Wildlife, the report of chief conservator of forests Bangalore and other information / details. Till then the such environmental clearances may be directed to be held in abeyance,” the report said. The CEC filed its report in compliance of the Supreme Court direction which passed the order on a PIL filed by an NGO, Goa Foundation, seeking probe in the illegal mining activities in the state. The state government had on September 10 temporarily suspended all mining operations till October 2012, but the petitioner alleged that suspension did not affect the trade as the private companies are transporting the ores from mines. The court is already seized of the illegal mining cases in Karnataka where, after halting all mining activities for more than year, it had on September 3 allowed operations in only 18 mines out of more than 100 mines where the irregularities were minimum.